This week Marie Macklin C.B.E. attended the meeting of the Glasgow Economic Leadership Board (ELB) chaired by leading entrepreneur, Lord Willie Haughey OBE, to provide independent leadership and direction for economic development activity in Glasgow. 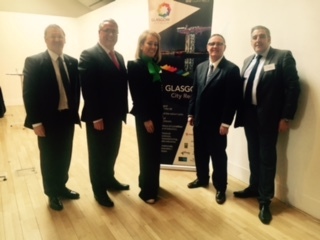 Marie also attended the launch of Glasgow City Region City Deal (GCR) hosted by GCR Chair, Councillor Frank McAveety. The City Deal will fund major infrastructure projects, drive innovation and growth through the support of key sectors such as life sciences, and address challenges in the region’s labour market. Marie said: “It’s a great honour to be asked to join the ELB board and I look forward to working with both the private and public sector to drive forward GCR – a bold and ambitious plan for Glasgow and the eight neighbouring local authorities.